LONDON–(BUSINESS WIRE)–According to the latest market research report released by Technavio, the global crowdfunding market is expected to register a CAGR of almost 17%. However, the growth momentum of the market is expected to decline due to a decrease in the year-over-year growth. 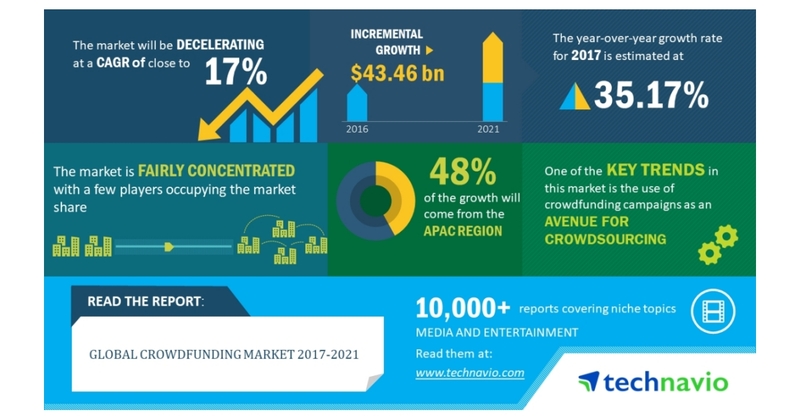 This research report titled ‘Global Crowdfunding Market 2017-2021’ provides an in-depth analysis of the market in terms of revenue and emerging market trends. It also includes an up-to-date analysis and forecasts for various market segments and all geographical regions. In 2016, the P2P lending segment accounted for almost 70% of the global market and is projected to decline to 54% by 2021, exhibiting almost 16% decrease in market share. Crowdfunding campaigns used as an avenue for crowdsourcing is an emerging trend in the media and entertainment services space. One of the best ways to crowdsource is by launching a crowdfunding campaign. By having a crowdfunding campaign, an entrepreneur can engage the target audience and receive comments, feedback, and ideas. This feedback can be extremely valuable as it helps understand aspects of their business from a different viewpoint. This could lead to a better product or service and could inspire some other ideal on similar lines.